Also known as Click and Clack, the Tappet Brothers of Car Talk on NPR. Tom and Ray did Car Talk locally from 1977 to 1987 before being invited to do a regular segment on NPR’s Sunday Weekend Edition with Susan Stamberg. Less than a year later, at the urging of then WBUR General Manager Jane Christo, NPR gave them their own show. Tom Magliozzi and Ray Magliozzi, aka “Click and Clack, the Tappet Brothers,” were the Hosts of NPR’s “Car Talk,” the most popular entertainment program in public radio history. Their honest, big-picture, hilarious approach to owning and ﬁxing cars made them a weekend staple for more than 4.5 million devoted listeners a week on 600 public radio stations, plus Sirius/XM and Armed Forces Radio. Tom and Ray did Car Talk locally from 1977 to 1987 before being invited to do a regular segment on NPR’s Sunday “Weekend Edition” with Susan Stamberg. Less than a year later, at the urging of then WBUR General Manager Jane Christo, NPR gave them their own show. The program was a tough sell at ﬁrst, remembers Producer Doug Berman. “The vast majority of public stations at that time were classical music stations. So, you’d call them up and say ‘Hey, I’ve got a great show featuring two mechanics who laugh about cars,’ and they’d put you on hold for 45 minutes.” But word of mouth soon spread, and before long, “Car Talk” was a huge hit for NPR. The success of the show led to appearances by Tom and Ray on The Tonight Show, Late Night, ABC’s 20-20, CBS’s 60 Minutes, and NBC’s Today. It led to spreads in national magazines from People to Smithsonian, roles in Pixar’s Cars, a nationally syndicated newspaper column, several books, and more than a dozen albums. However, there were some offers they continually turned down. Tom explained that they regularly declined offers to host their own TV show. “With radio, you sit in front of the mikes and you talk to people, and you have a good time with them. And that’s the show. With television, there are 45 people standing around holding wires, and you sit in front of hot lights all day, and you do 150 takes until nothing’s funny anymore, and you get ﬁve minutes of television out of it. We’re too busy for that. We have important gooﬁng off to do! 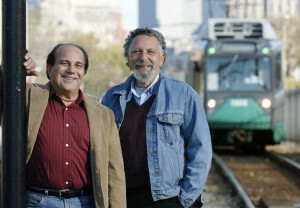 “Car Talk” ran on 1977 to 2012, when Tom and Ray retired. Edited reruns still air on NPR affiliates. Tom Magliozzi passed away in November 2013 at the age of 77.